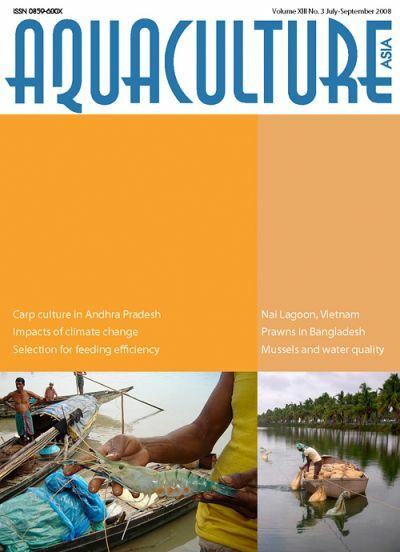 Peter Edwards writes on rural aquaculture: Comments on possible improvements to carp culture in Andhra Pradesh. Aquaculture and environmental issues in the region of Nai Lagoon, Ninh Hai district, Ninh Thuan province, Viet Nam. Climate change impacts on fisheries and aquaculture. New initiatives in fisheries extension. Selection potential for feed efficiency in farmed salmonids. Freshwater prawn hatcheries in Bangladesh: Concern of broodstock. 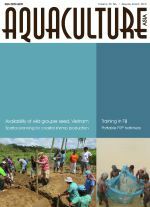 Production of Cirrhinus molitorella and Labeo chrysophekadion for culture based fisheries development in Lao PDR 2: Nursery culture and grow-out. Mussel farming: alternate water monitoring practice. Benefit-cost analysis for fingerling production of kutum Rutilus frisii kutum in 2005 in Iran. The effects of feeding frequency on FCR and SGR factors of the fry of rainbow trout, Oncorhynchus mykiss. The use of poultry by-product meals in pelleted feed for humpback grouper. Production update: Marine finfish aquaculture in the Asia-Pacific region. Crustacean parasites and their management in brackishwater finfish culture. Aquaculture certification guidelines development process continues in Beijing, Washington D.C.
Development of BMPs for catfish farming in Vietnam - survey of management practices. NACA extends cooperation with ADB for tsunami rehabilitation in Indonesia. International hands-on training programe on molecular biology techniques. Cage aquaculture carrying capacity tool now available. 6th Regional Grouper Hatchery Production Training Course completed. 2008 Forum on Fisheries Science and Technology, 25-27 September 2008, Shanghai, China. Aquaculture success stories write shop. New publications for free download.